Michael Kimberly is on a mission to obliterate the Obama administration's signature water quality rule. Marshaling a coalition of business groups opposing the Clean Water Rule, Kimberly was recently named "liaison counsel" in combined lawsuits targeting the regulations in the Cincinnati-based 6th U.S. Circuit Court of Appeals. That makes him the designated intermediary between the court and dozens of business challengers that include the American Petroleum Institute, U.S. Chamber of Commerce and American Farm Bureau Federation. A victory could make Kimberly, 35, a partner at the law firm Mayer Brown LLP, the go-to guy for corporations fighting environmental regulations. Beyond the 6th Circuit, the rule -- also known as Waters of the United States, or WOTUS -- is facing challenges in a series of complex lawsuits in other courts. The issue is ultimately expected to be resolved by the Supreme Court. Kimberly's oldest son, now 7, could be in high school by the time these lawsuits are resolved. That's a long haul for a lawyer who describes himself as impatient. Nonetheless, Kimberly is looking forward to playing a central role in the fight, which involves a broad range of wonky but vital legal issues -- such as which courts should hear Clean Water Act fights and how much leeway judges should give to agency bureaucrats. This case could be one where "really fundamental questions about administrative law -- and what agencies can and can't do -- really come to the fore," Kimberly said. "I think we've gotten to a point -- and it's perhaps understandable, I think, with the dysfunction in Congress -- that President Obama's administration has taken a very aggressive approach to rulemaking. And underlying all of this are really important, pressing and interesting issues about the balance of power among the branches." During a recent interview at Mayer Brown's K Street office in Washington, D.C., Kimberly wore a pink button-down shirt and trendy round-framed glasses. He says the flecks of gray in his cropped brown hair help him look older. "More than one person has told me, were it not for the gray hair, I'd look like I was 12," he joked. Although he's young, Kimberly has already been involved in several big water and air pollution cases in federal appeals court, and he's hoping to make environmental litigation a central part of his practice. "With EPA on the tear that it is, I don't think this litigation is going anywhere," he said. At issue in WOTUS is what waterways and wetlands get automatic regulatory protection from U.S. EPA and the Army Corps of Engineers under the Clean Water Act. The government insists WOTUS is on firm legal footing. Meanwhile, greens are also challenging the regulation in the 6th Circuit as not going far enough. Jennifer Chavez, an attorney at Earthjustice who's the liaison counsel for environmentalists, said, "While industry is painting a picture of new regulations and new reach, in fact the rule constricted the reach of what EPA and the corps consider to be waters of the U.S., and much of the industry's allegations are just plainly exaggerated." The battle is set to heat up soon, with the first briefs due in September. But in a complicated case where parties are even arguing about which court they should be in, Kimberly mapped out a possible scenario where the legal fight could still be simmering in 2021. He's working closely in the case with Tim Bishop, a partner in Mayer Brown's Chicago office and one of industry's best Supreme Court advocates in environmental cases. "Michael is a first-rate lawyer with impressive appellate advocacy experience for a lawyer of his age, including cases before the U.S. Supreme Court," Bishop said. 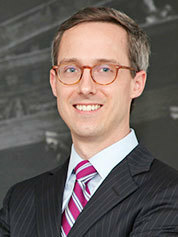 He added that Kimberly "is certainly on track to become a top environmental appellate lawyer." Kimberly argued before the Supreme Court last year in a congressional redistricting case, where he won in a unanimous ruling written by the late Justice Antonin Scalia. The two lawyers also worked together to score a Supreme Court victory for the timber industry in a 2013 case over stormwater runoff regulations, Decker v. Northwest Environmental Defense Center. They were also victorious in a 9th U.S. Circuit Court of Appeals case where they defended EPA air pollution policies against environmentalists' challenges. In the complex WOTUS case, Kimberly and Bishop will be teaming up again to coordinate their own coalition of 18 trade group clients and more than a dozen other business groups as they prepare to submit a single legal brief laying out their arguments to the judges. Ellen Steen, general counsel and secretary of the American Farm Bureau Federation, said, "Anybody is in good hands when Michael is representing them." He's "capable beyond his years" of experience, she added. Kimberly and his wife, Emily -- a veterinarian -- live in Maryland with their three boys. They've got a golden retriever named Ruby and a cat named Freckles. Freckles the cat isn't freckled, though, it's striped. "It's an ironic name," Kimberly said. Kimberly, a New Jersey native, met his wife in high school in Alabama. Kimberly and his family, including his identical twin and three other siblings, moved to the South when their father got a new job at the University of Alabama, Birmingham. Kimberly headed north again for college when he attended Princeton University as an undergraduate. He thought he wanted to be a doctor, like his father, so he majored in philosophy and molecular biology, and he worked in research labs over the summers. "It's really, really slow," he said of lab work. "Day to day, it just wasn't engaging and interesting enough." He wound up getting a master's degree in bioethics from the University of Pennsylvania, then headed to law school at Yale University. He started law school thinking that he'd also enter a Ph.D. program for health policy at Harvard University, but he dropped that plan after his first year in law school. "The things that I liked about science, I think, translate equally well into the law," he said. He did a clerkship on the 9th U.S. Circuit Court of Appeals for Judge Michael Daly Hawkins, a Clinton appointee who works out of Phoenix and is now a senior judge on the court. Kimberly started at Mayer Brown in 2009 and was an associate until he officially became a partner on Jan. 1 of this year. He's made his mark at the firm as a top environmental lawyer, and he's been cited as a lawyer to watch by several news organizations. "One of my personality flaws is that I'm generally impatient," he said. "I guess my impatience has encouraged more experience than is typical for my age."